If one were to apply contemporary principles of evaluation to the work of Peyton Rous in his time and without the benefit of hindsight, this work would certainly be assigned a low priority, not fundable, and probably also not publishable in the trendsetting journals that today alone can confer recognition and prestige. Even in 1966, the year of the [Nobel] prize, it was impossible to guess at the full significance of the Rous sarcoma virus for human medicine and biology…The urgent lesson from the Rous experience, then, should be that it is the quality of the science that counts, not its compliance with a fashionable trend and not its perceived future value, which cannot be predicted. One hundred years ago today, Peyton Rous published the first in a series of papers describing experiments that began with work on a sarcoma from a single Plymouth Rock hen. In that initial paper, Rous showed that bits of the tumor could establish new tumors when injected into healthy chickens. A year later, in 1911, Rous published what has become a classic in the annals of virology — A Sarcoma of the Fowl Transmissible by an Agent Separable from the Tumor Cells — reporting that the tumors were transmissible from one chicken to another by injection of a cell-free, filtered homogenate of the tumor tissue. The conclusion, since confirmed a thousand times over, was that a virus caused the tumors. The virus, now known as Rous sarcoma virus (RSV), went on to play a starring role in 20th century biomedical research. Historical accounts tell us that Rous’s findings were initially dismissed by many as a peculiarity of chicken sarcoma, with little or no relevance to human cancer. The view one hundred years later is far more spectacular. In the 1930’s, reports of oncogenic viral agents began to emerge from laboratories studying cancer in inbred mice. Some of these cancer-causing viruses, like Rous sarcoma virus, had RNA genomes, and as a group they came to be known as the RNA Tumor Viruses. In 1958, Howard Temin and Harry Rubin published a description of a quantitative assay for studying Rous sarcoma virus in tissue culture. The assay took advantage of the rapid and reproducible way in which RSV transformed cells. Specifically, diluted solutions of virus could be applied to monolayers of cells, which were then overlaid with agar. Localized “foci” of transformed cells would then form. Virologists could count foci in a monolayer of cells the way bacteriologists count plaques on a lawn of bacteria, back-calculating to determine multiplicity of infection. Thus, by the 1960s, the study of RNA tumor viruses had become a mature field encompassing both in vivo animal studies and tissue culture-based, bench-top experiments. In 1966, Peyton Rous’s contributions were belatedly recognized with a Nobel prize. Howard Temin’s studies of RSV transformation in tissue culture, and in particular the observation that the transformed phenotype remained stable during passage of transformed cells, led him to the startling hypothesis that the RNA tumor viruses replicated through a DNA intermediate, or provirus. Although Temin published several papers in support of his provirus hypothesis, most of his contemporaries did not see the light until 1970, when he and David Baltimore independently proved that virions of RNA tumor viruses contained RNA-dependent DNA polymerase activity. This enzyme came to be known as reverse-transcriptase (RT). An opinion piece summing up the ensuing flood of follow-up studies was appropriately titled Apres Temin, le Déluge. In the wake of this flood, Francis Crick even felt obliged to defend the so-called Central Dogma of molecular biology. In addition to revolutionizing the study of RNA tumor viruses (subsequently called retroviruses), the discovery of RT was a watershed event in molecular biology, providing the means for generating cDNA and the key to reverse transcription–PCR (RT-PCR). In recognition of their work, Temin and Baltimore received the Nobel Prize in 1975. By the 1970’s several groups had begun zeroing in on the molecular nature of acute transformation of cells by RSV. 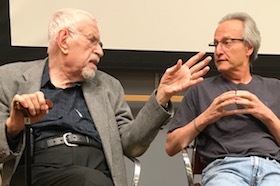 Peter Duesberg and Peter Vogt reported that the RSV genome contained an extra bit of sequence not found in the genomes of very closely related, non-transforming viruses. In 1975, Dominique Stehelin, J. Michael Bishop, Harold Varmus, and Peter Vogt reported that this extra sequence was homologous to a host gene. The host gene, called src (from sarcoma) was the first proto-oncogene, and v-src (the version found in RSV), its oncogenic counterpart. Like RT before it, the discovery of viral oncogenes incited a dramatic shift in experimental emphasis, this time by giving scientists a molecular beachhead in the war on cancer. For discovering the cellular origins of viral oncogenes, Bishop and Varmus received the Nobel Prize in 1989. It is noteworthy that during the sixty-six years separating Rous’s chicken experiments and the discovery of src (1910-1976), no retroviral pathogens of humans were known (it wasn't until 1980 that Robert Gallo’s group reported the isolation of HTLV-I, the first human retrovirus). Thus, seven decades of work on retroviruses had already had a profound impact on biomedical research when, in 1983, the RT-assay described by Temin and Baltimore helped Francoise Barré-Sinoussi and Luc Montagnier detect a new retrovirus in the cells of an AIDS patient. In 2008, Barré-Sinoussi and Montagnier were awarded the Nobel Prize for discovering the human immunodeficiency virus (HIV-1). All thanks to Dr. Rous and his prize-winning hen. Welkin is Assistant Professor of Microbiology and Molecular Genetics at Harvard Medical School, and an Associate Blogger for Small Things Considered.